The first Senior Production of the year will be "Harvey"
The first major production of our 75th Anniversary year will be the Pulitzer Prize winning play “Harvey” by Mary Chase. Directed by Trevor Nicol, this comedy was first performed on Broadway in 1944 which seems very fitting this year. Tickets now on sale - go to the Tickets page or ring the Box Office, by calling 0333 666 3366. The telephone box office service is available Mondays to Fridays, 9:00am to 7:00pm (excluding bank holidays) and Saturdays 9:00am to 5:00pm. If you call outside these hours there is an answering service where you can leave your number and they will call you back. Calls to 03 numbers cost no more than a national rate call to an 01 or 02 number and must count towards any inclusive minutes in the same way as 01 and 02 calls. These rules apply to calls from any type of line including mobile, BT, other fixed line or payphone. 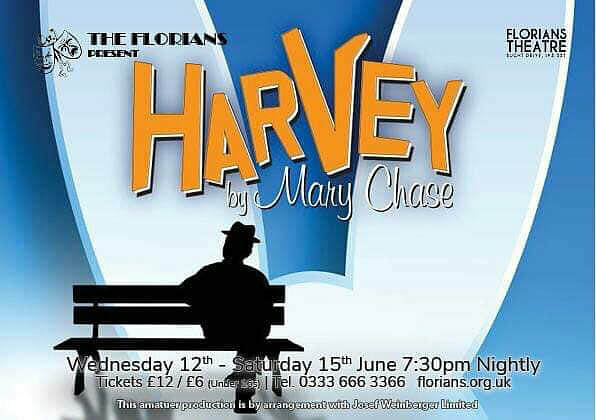 Production dates are Wednesday 12th to Saturday 15th June 2019, at 7:30pm.